The best performing Industrials & Materials stocks in Q1 have been focused in the commodity markets – HUN, OLN, and WLK in Chemicals, and AA in Metals were all among the top 10 performers. We wrote early in the year that commodity rallies rarely falter in Q1, and we could see further moves higher yet. 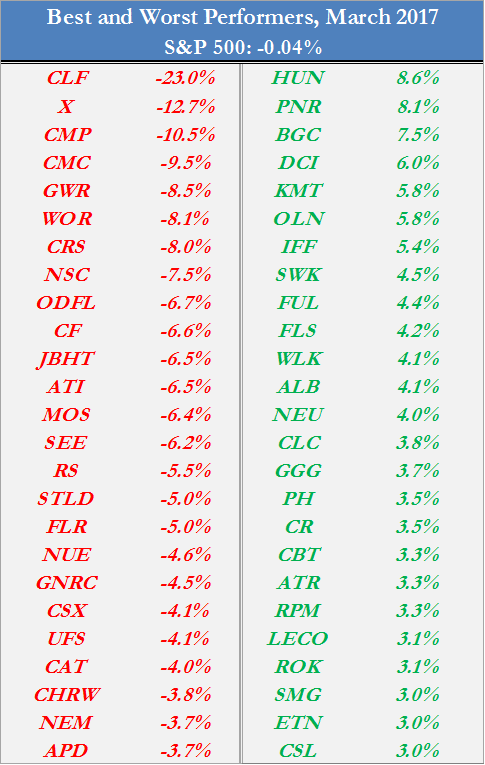 CSX tellingly leads the way as the top performer in Q1, less as a result of the improving rail traffic picture in the US and more due to management shakeup at the behest of an activist. Much of our research of late has been focused on similar stories as the incremental improvements in the economy remain too sluggish to move the needle and the prospect of any near term fiscal help appears to be fading, spurring companies and activists to push for change. GE has not responded as well as CSX has to prospective management turnover – the stock is among the worst performers in Q1. 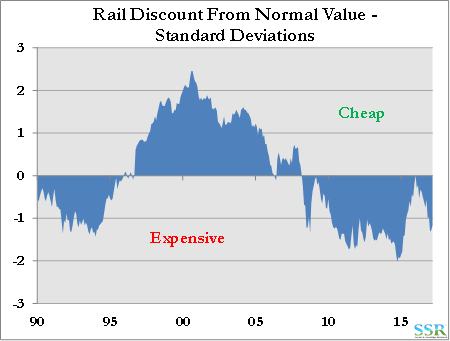 We see the value in the stock and the dividend yield pays you to wait for change. PPG is trending higher as its attempt to acquire Akzo Nobel unfolds. We believe the company could raise its bid as high as €100 per share. Akzo has had its hand forced on a specialty chemical spin that likely should have occurred years ago and appears to be in a weak position with respect to investors. 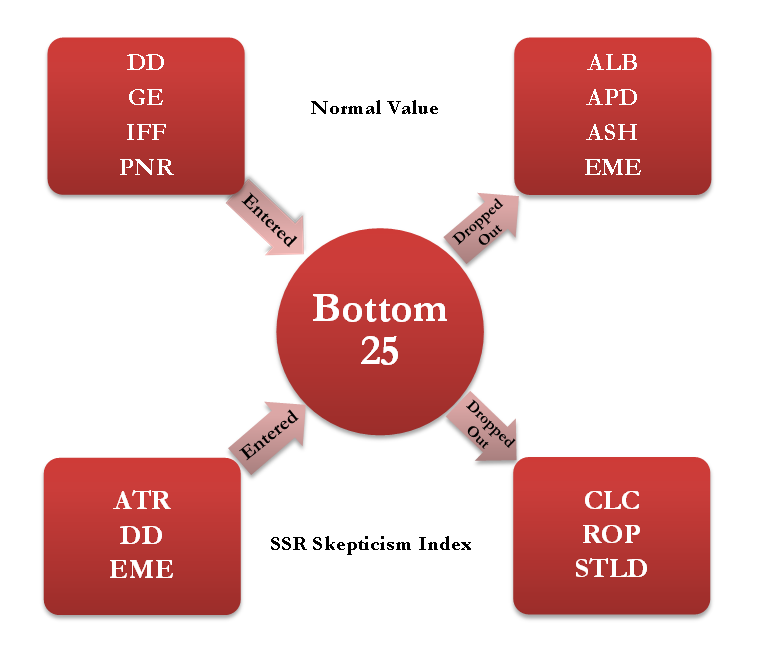 Eastman seems in obvious need of having its own hand forced – like GE, this is a complexity and expectations story, where significant cash generation and value is obscured by a convoluted, disliked portfolio. Unlike GE, EMN is small enough to see change effected reasonably quickly, and the upside would be significant. Three months into 2017 and we have seen little progress on tax reform or infrastructure build out, and little indication that the governing party can effectively legislate after a botched attempt at healthcare reform. 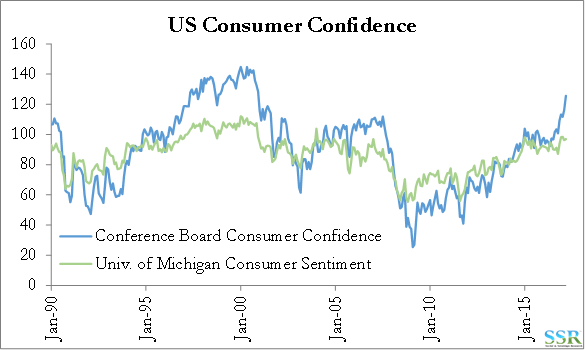 Consumer confidence, however, is at levels not seen since the early 2000s however – Exhibit 5 – and higher consumption drove a positively revised Q4 GDP figure. 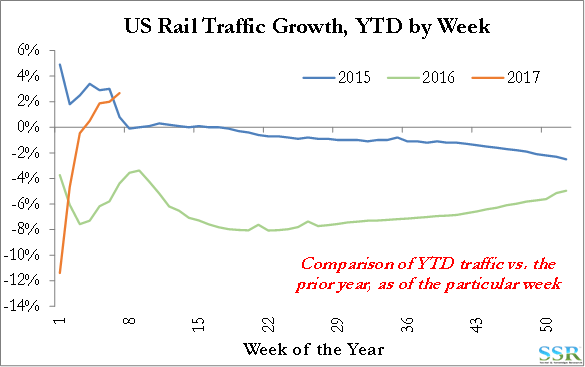 Continually improving rail traffic – Exhibit 6 – signals strength in the domestic economy, confirmed by positive readings on manufacturing activity and new orders. 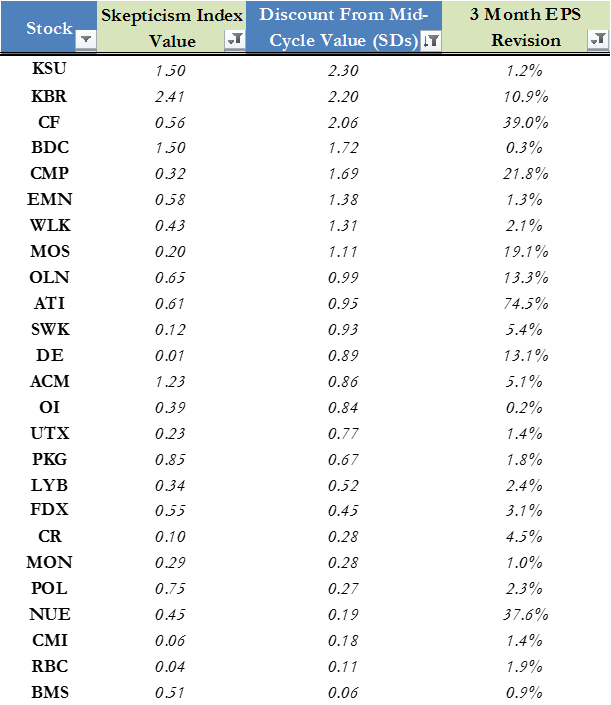 There may be sufficient momentum to sustain the economy until fiscal policies around tax/infrastructure initiatives potentially unleash a more robust, 3-4% growth engine not seen in many years – the risk is that the legislative failures of healthcare carry over and the current optimism fades. 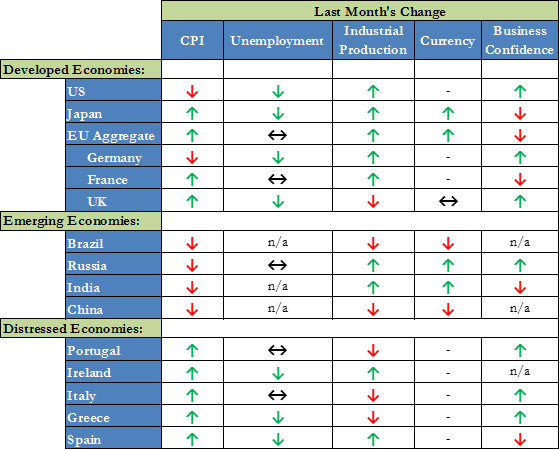 Sector performance for the month and Q1 is shown in Exhibit 7. 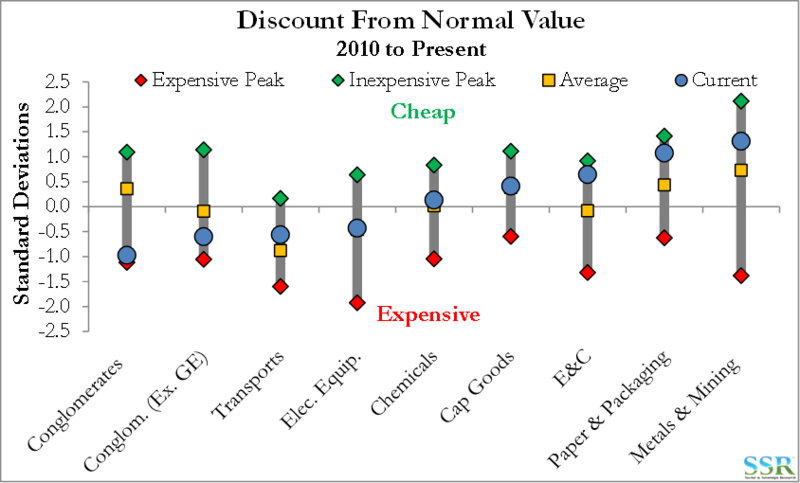 Commodity stocks drove the outperformance in the Chemicals space. 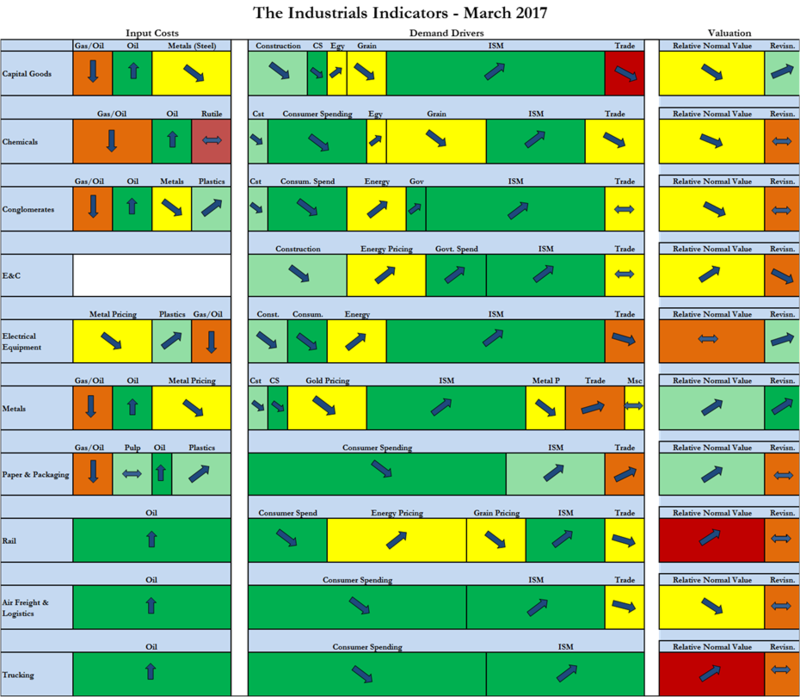 In Electrical Equipment it was a mix of small caps (IIVI +22%) and large (AME, ROP, ROK all in the top 25 in Q1). 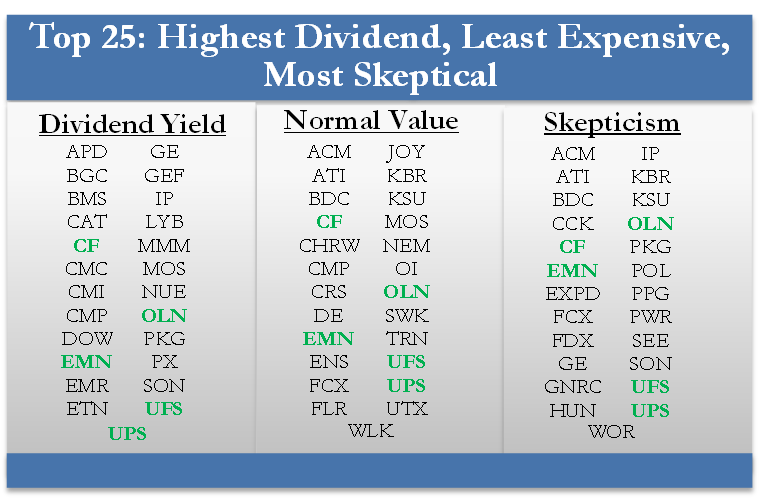 We show the 25 best and worst performing stocks for these periods in Appendix 1. 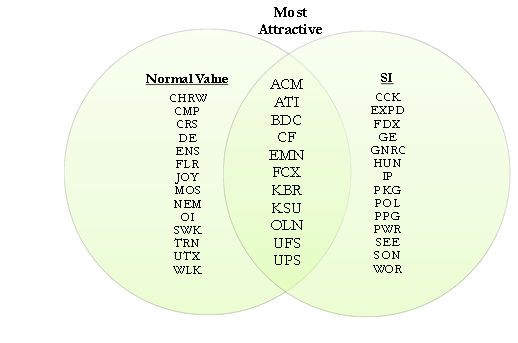 Exhibit 8 summarizes discount from normal value by sector. Conglomerates supplant Transports as the most expensive group after divergent performances over the past month. 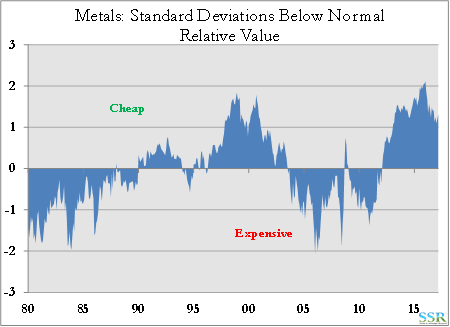 The ordinal ranking is otherwise unchanged from a month ago, with Paper & Packaging and Metals showing the best values, both more than a standard deviation below mid-cycle. 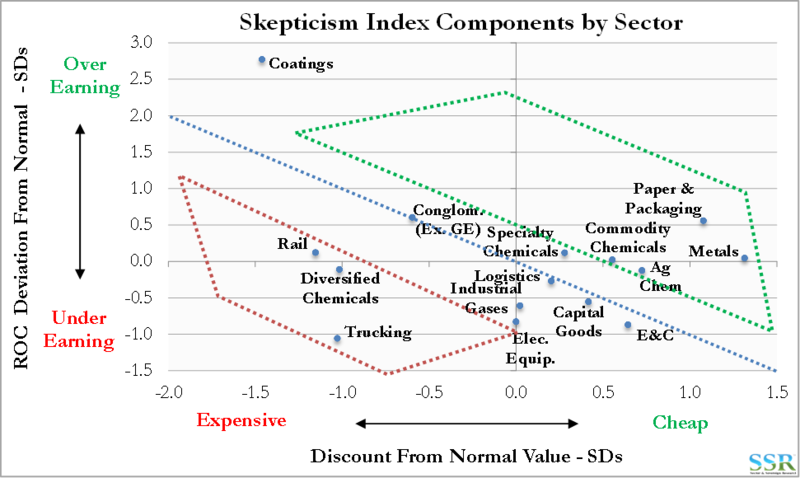 Values for our Skepticism Index are summarized by sector in Exhibit 9 (see our skepticism work for more detail). 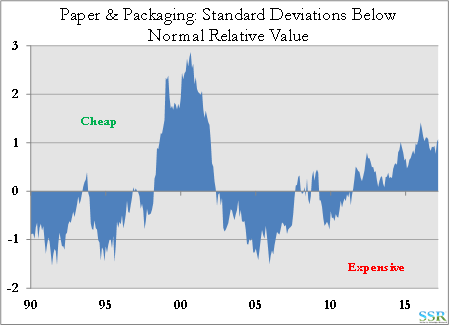 Valuations are insufficiently crediting returns that remain above trend in the Paper & Packaging space and are improving for Metals companies. 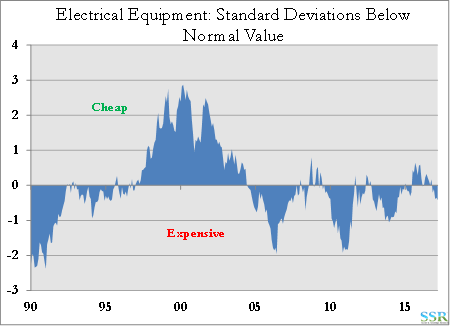 The opposite is true in Electrical Equipment where valuations are anticipating an above trend returns that have yet to be seen. 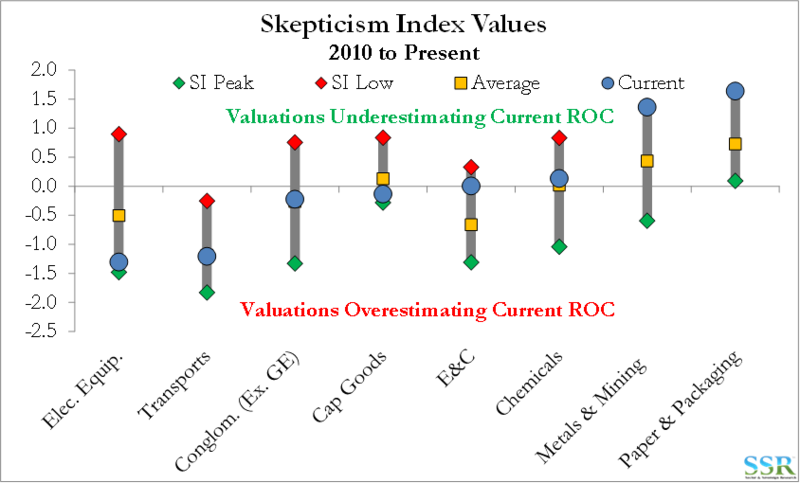 Exhibit 10 is a very busy chart but shows how each sector and sub-sector breaks down by skepticism index component – valuation versus ROC. The Commodity Chemicals space remains inexpensive with returns at trend and likely to improve as HUN and OLN should see continued momentum in their end markets, while the ethylene producers are likely to see less pressure than consensus currently believes. 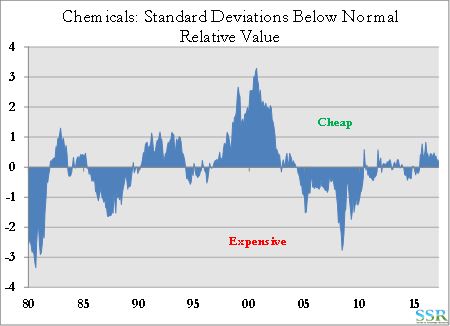 Diversified Chemicals is largely driven by DD, which looks expensive without the benefit of DOW merger synergies. 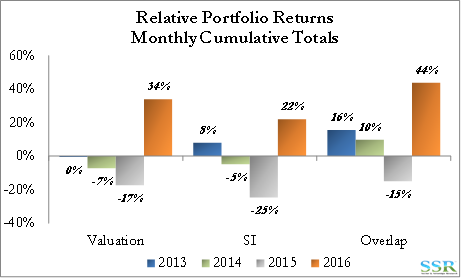 2016 was a strong rebound year for our portfolio selection methodology, particularly in the overlap of valuation and skepticism – Exhibit 11. 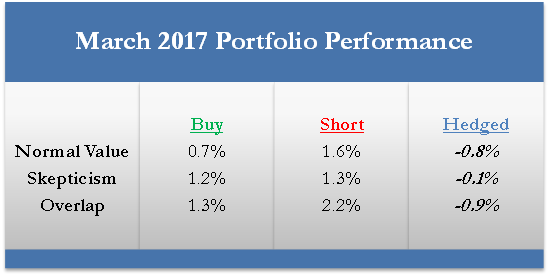 Results in 2017 to date have been mixed and volatile as Metals stocks in particular are showing extreme sensitivity to indications of success or failure in the Trump administration. See accompanying work from earlier in the year. 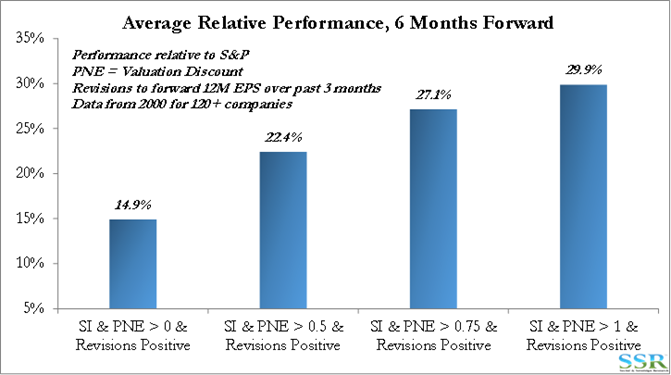 An alternative portfolio approach is based on our expanded skepticism index performance analysis which showed a very attractive risk-reward relationship for stocks with positive SI values, valuation discounts, and positive 3 month EPS revisions. 25 stocks currently fall in these historically outperforming ranges – Exhibit 12 – including several of the names we are most positive on such as LYB, SWK, and EMN. 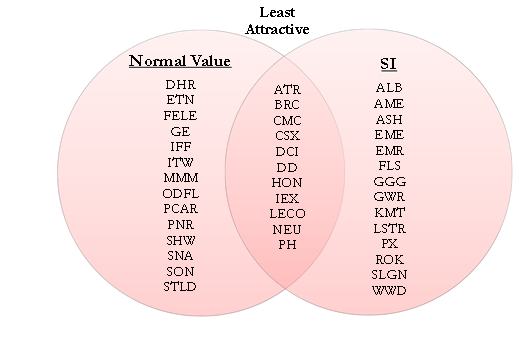 Exhibit 13 shows the historical forward performance of the stocks meeting the criteria in Exhibit 13 at various ranges. 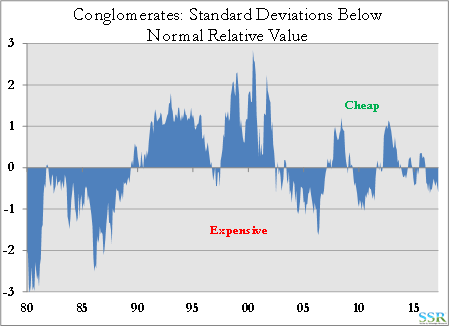 We note that for all ranges where the SI is above 0.5, the average return is in excess of the variability (average > standard deviation). Consumption boosted US fourth quarter GDP to a revised 2.1%. Consumer confidence remains strong and will need to remain so to push the economy towards more robust growth. Business sentiment is equally strong, with very healthy ISM readings, particularly for new orders. The formal Brexit proceedings began with considerable fanfare but has yet to trip up an incrementally improving European economy. Data out of China continues to be positive if you believe it, but Q1 growth was underpinned by the traditional government spending model which becomes increasingly harder to sustain. In Exhibit 20 we look at expected net income growth by sector, and in Exhibit 21 we plot the growth figure against each sector’s current skepticism index value. The ordinal ranking in Exhibit 20 remains unchanged from a month ago. 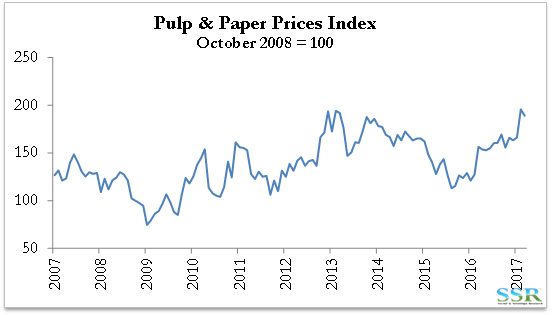 The Metals group has a somewhat low base which inflates its growth figure in Exhibit 21 but there is likely also a good deal of stimulus optimism embedded in 2018 estimates. Exhibit 21 is curious in that one would expect the line of best fit to trend in the opposite direction. 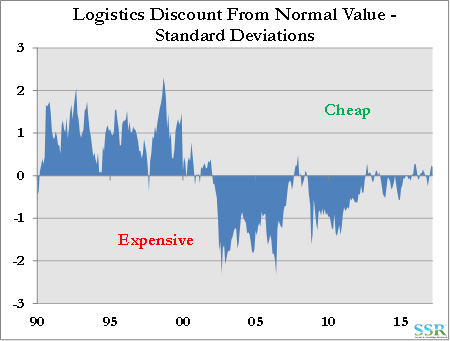 The skepticism extremes in Paper & Packaging and Metals are on display here as valuations fail to reflect the forward growth expectations which were among the most positively revised on the month – Exhibit 22. Exhibit 23 shows average 2017 EPS revision over the past month and Exhibit 24 plots these revisions versus performance results on the month. 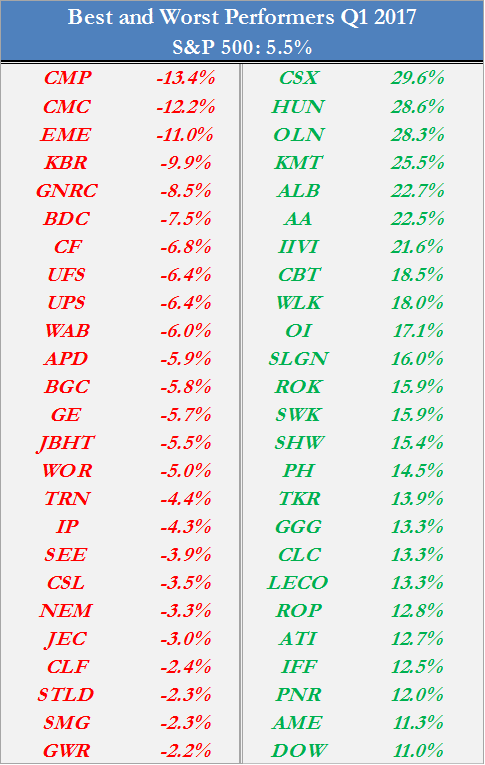 Metals revisions were again the most positive in the group, most strongly in AA and NUE (each +20%), though this did not carry over into performance. 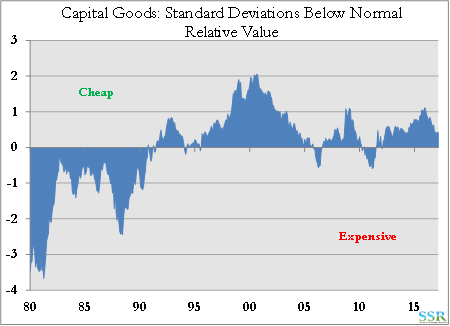 Excluding the soon to be acquired JOY, Capital Goods would have been roughly flat, in line with other sectors. March 19, 2017: Trying to Make Sense of GE: Are the Green Shoots Appearing? 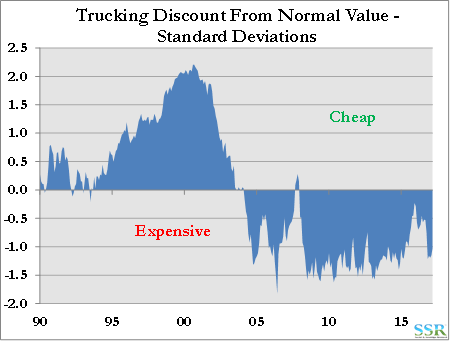 March 9, 2017: Aluminum and Steel: Costs Pushing Prices, So Are We Investing or Gambling? 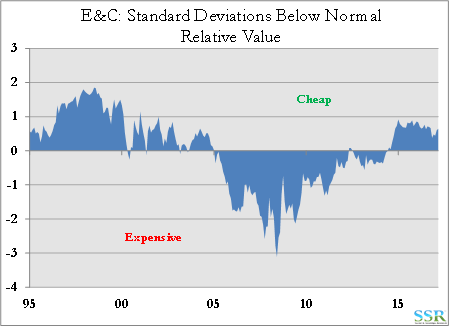 In Exhibit 46 we show a screen of stocks with low value, high skepticism and high dividend yield. 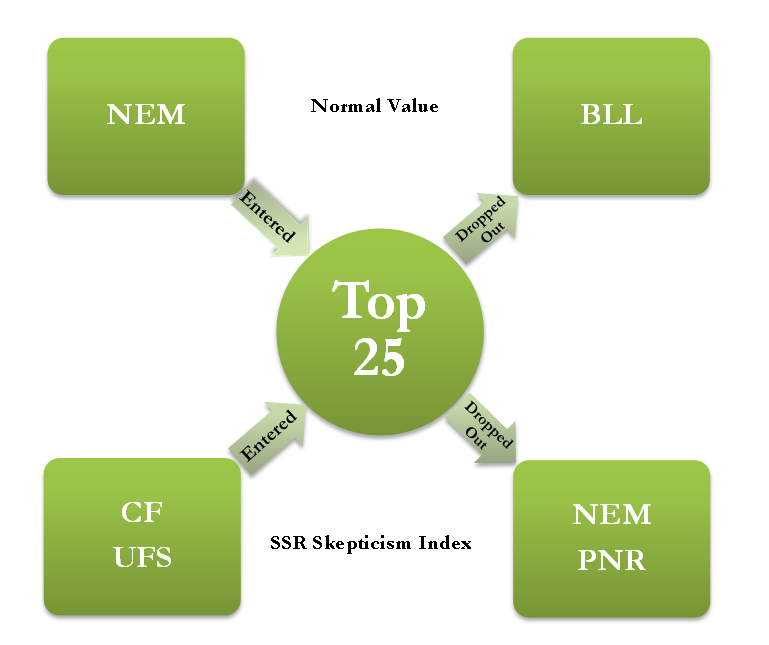 CF and UFS join last month’s holdovers, EMN, OLN, and UPS, as the only stocks to appear on all three metrics.